[Marek Walther] uses a ThinkPad x41 tablet for business on a daily basis. Since he’s on the go with the device he figures that hardware failure is eventually going to strike and with that in mind he purchased a second unit – slightly broken – to fix as a backup. He had never been excited about the speed of the tablet so he set out to find improvements. One of the options was to replace the traditional hard drive with a solid state model (translated). But simply dropping in an SSD isn’t going to make things faster. That’s because the stock drive uses a PATA interface. After a bit of snooping [Marek] discovered that the motherboard has a SATA interface that has a bridge connecting to the PATA plug. By removing the bridge and soldering a SATA cable to the board he was able to improve performance while increasing storage capacity at the same time. Simply upgrading the low grade dog food hard drive that is 4200rpm with a 7200rpm PATA makes a significant difference in most older laptops. @fartface so does replacing it with a SSD. Darn, I thought I was cool by replacing my x41t’s drive with an adapter and a compact flash card. It was the only thing that would fit with that oddball Hitachi 1.8″ drive bay. Instead of pasting a dead ebay link, maybe say what the hell it was (at least in addition to the dead link) you fool. Life2Death it isn’t a dead link as I just went to it fine. I have one of these machines. I was able to sell the 60GB hard disk inside for almost the entire cost of one of the 60GB SSDs that were made for them. Inside the SSD case is a Samsung SLC ZIF PATA SSD. Worth it. Now I wonder if the similarity between the ThinkPad X41T and the Motion LE1600 also includes the bridge chip. That machine could use an upgrade. @Hrpuffnstuff: It’s valid now, but in a month or so when someone comes across this story and wants to see what durfdee used, they’re out of luck. This has to be one of the most awesome hacks I’ve seen. It’s an actual modification of the laptop’s hardware to fix an actual problem. No blinking lights, no arduino, no tapping a parallel port. An actual PCB level mod. Many have done similar hacks. I’ve added sata to my Acer Aspire One A110 motherboard and put in a 2.5″ Intel X25-V 40GB SSD. Originally this model doesn’t come with a harddrive at all because there is no room. But it has a small 1.8″ pata zif SSD. Anyway I had to remove the aluminum housing from the intel SSD and grind a little to make everything fit. 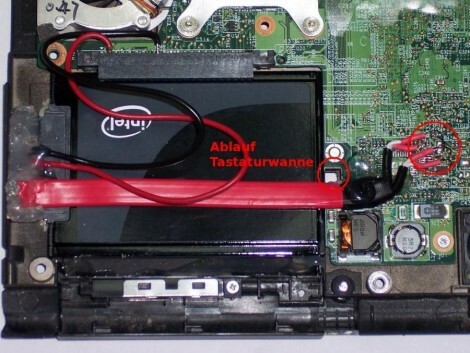 I’m always amazed by people who hack directly onto computers motherboard. The level of complexity and the skill it takes simply outcast me. an actual hack! soldering directly on your mobo is always a hack. i could solder some of the missing connectors on my mobo, but would they work? probably not. i have enough trouble soldering a microusb connector on my wireless adapter. i’ve soldered it on like 10 times (probably why it doesn’t work now) but i probably cooked it by now, so there’s not much chance of me soldering on a new motherboard. maybe a 5 year old one..
Now this is freakin cool… The X40/41/41T was one of the last old-school brick-shithouse thinkpad lines before lenovo jumped on the widescreen bandwagon… The only thing that’s stopped me from picking one up for years was the 1.8″ HDD – You can get a stripped X4* relatively cheap, but the savings are completely offset by the cost of the drive. With SATA gear as cheap as it is, this brings a new breath of life to the line. …5-6 years ago ebay was loaded with A/T2*’s…3-4 years ago it was T/X3*’s…Since then, T4*’s have been all over. There have been quite a few X4*’s lately, but once the corporate leases start to expire the flood gates will open and they’ll be a dime a dozen… I know what my next laptop purchase will be! Which 60gb ssd drive is made for the x41? Any link to purchase one? Well, the flood gates must have opened on the IBM X41 tablet because I just bought one on ebay from vtkwholesale for $45 + 10 shpg. It’s in very good condition; only needs a drive and an OS. For now I’m using an external laptop drive with USB and Ubuntu 11. It runs GREAT. Oh, I did upgrade to 1.5GB of ram, too. It didn’t come with the pen or Win XP restore disks but the battery works for two hours. I love size of it. It’s just right for surfing while I watch tv. If anyone is wondering – Windows 8 runs very well on the X41 Tablet. I was still using the stock XP Tablet OS, and I am blown away at how much life has been restored to this tablet with Windows 8. I bought a Transcend 500x Compact Flash Card and a PATA to CF card converter on ebay and installed it in the hard drive bay and it works extremely well. I couldn’t be more pleased and it’s an easy hack. Sounds like you avoided the soldering step. Could you elaborate on what you did? Thanks. Did you transfer Windows to the flashcard? How was it done? No, I installed Ubuntu linux. Windows takes too much memory to run, so it would be very slow. Indeed– (L)ubuntu runs extremely well on my x41 tablet, while Windows XP is terribly slow. I know this was posted 6 years ago but can you show what points to solder to. the link given leads to a website that requires a login. All you need is an adapter and a compact flash memory card. Install it in the area where a hard drive would go. Add an operating system like Linux Mint and you’re good to go. It’s very easy when you use an adapter. I replaced the 1.8″ HDD in my X40 with an IDE to mSata adapter and a 120GB mSata SSD. runs well.